My yogic practice began eight years ago, at the age of 16, in a lush tropical setting on the island of Bali , Indonesia . The transformation and magic that I experienced during this one intensive summer of introduction into asana and spirituality drew me directly towards a free yoga class in Albany , NY , as I embarked upon my first year in college. Throughout my four years in school, I was a loyal practitioner to such an extent that my gracious yoga teacher gave me my first opportunity to lead a class of students through a yoga sequence. As terrifying as the first experience was, I gained a tremendous amount of confidence afterwards and found a true longing to teach. For the past two years, I have been working with children of all ages in a variety of settings. Now based in Hartford, CT I have worked at Watkinson, a private high school in West Hartford, the Academy of the Performing Arts in Hartford, a magnet school, Summer Place (an annual summer program through the University of Hartford), the Bridge Family Center (an outreach program for troubled youth), Fuller Movement Center and West Hartford Yoga Studio. Shortly after completing my yoga teacher training at the Kripalu Center for Yoga and Wellness in November 2004, I was motivated and inspired to jump into the world of teaching. My first class came about after a myriad of phone calls and emails sent to various studios and centers. Justine, the owner of Fuller Movement Center , a relatively new space at the time was very generous and open to the idea of allowing me to work with her and bring new people into the warm and brightly painted space. This studio had just opened two months before and I was able to be a part of the early stages of development. I began taking steps to design my first ‘creative movement’ class for kids ages 4-7. This course, designed for 5 weeks, included a variety of exercises to allow young boys and girls to get in touch with their breath and be more comfortable in their own bodies. Each Saturday morning, the group of bright and shining faces dashed into the room with open arms, ready to play games, draw, dance and listen to stories and music. The most well received activity was story-telling. I took the children on many creative visual journeys. We’d begin by smelling flowers and then make our way through the forest and become the plants and trees and then larger animals, until we were one with the wind and the sun and the moon. Eventually, we travelled to the ocean floor, resting as starfish and gazing up towards the glowing sun. After overcoming some challenges and triumphs in this first program, I was inspired and motivated to reach out to more young people. My next opportunity came through West Hartford Yoga, a well-known center. ‘Teen Power’ was designed for girls’ ages 13-17. This class, meeting weekly provided a wonderful substitute to other after-school activities for teens with a less competitive and more contemplative frame of mind. In a community where there are so many activities for children involving competition and struggle, it was a pleasure to be a part of something that allowed young girls to just be themselves in an environment activity free from the demands of comparison and judgment. Another blessing was graced upon me last fall, when I was asked to take a class in the school district. Working within a private high school, where the students are very comfortable with one another allowed a greater level of trust to develop within the yoga class. 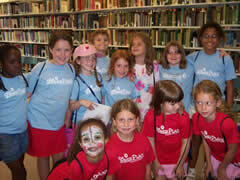 The group of all girls, met with me three times a week and they were always very eager to try new things. We developed a song to move through the sun salutation. I also brought in flowers to make the experience of breath control more tangible. We practiced deeply inhaling the smells of the various flowers. The children would also close their eyes as they inhaled and notice the different feelings that came up when breathing in different ways. There was one particular class where many questions arose about diet so we devoted an entire period to discuss the benefits of a vegetarian diet and despite the fact that these girls were all less than 13 years old, nearly everyone was sincerely receptive to learning new ways to optimize their health and growth. When one good event occurs, many soon follow. Within weeks of starting at one school, the Academy of the Arts, a public high school was in need of a yoga instructor. This was a very different atmosphere; the students came from many different school districts and backgrounds to come together and practice various art forms. The class, meeting twice a week, consisted of 9th through 12th graders. There was some apprehension in the beginning of the year to relax around other young people of the opposite gender but this hesitation quickly passed once we played some simple games to get to know each other; I incorporated names with yoga poses and had each student share something silly about themselves. I encouraged frequent smiles and laughter in class, as the key to good asana practice. As the year progressed, their energy levels and curiosity rose creating a nice flow and connection within the classroom. In this course, there was an emphasis on exploring more than just the physical postures. Each quarter, I gave the students an assignment based on different branches of yoga, including yama and niyama, the moral and ethical guidelines, therapeutic benefits of the poses, developing postures best suited for an individual’s needs and meditation. There was an abundance of creativity and playfulness within the classroom. The course also generated many questions about yoga philosophy and lifestyle. By the end of the year, the students were comfortable and confidant enough to lead some warm-ups and asanas. They were even requesting their favorite poses; one student, Kelly asked me if she could lead sun salutation and a few other favorite poses. I encouraged this whole-heartedly. Kelly is now in my class for a second year at the Academy and I plan on developing her confidence with her asana practice by giving her greater responsibility as well as nourishing her budding interest in meditation. Over the summer, I taught 10 classes per week at Summer Place, for young children ranging from 7 to 14 years old. Though the classes were short, the energy levels and enthusiasm was very high. We played many yoga games to spark their interest in different ‘animal poses’. I encouraged making sounds and developing stories based on the animal pose. Partner stretches were the most popular; they were well received and yielded very positive results. Several of the students are still working with me in another program recently introduced at Fuller Movement. The most recent program, I have contributed to this past summer is the Bridge Family Center . West Hartford Yoga contacted this group and offered free classes to the students that come to this center for after-school help and other activities. These children were introduced to yoga for the first time and were very reluctant to move in new ways around their peers. This class presented true challenges in patience and understanding, for me as well as the group. Even though there were still some students who were shy and quiet at the end of this course, it is certain that a small seed of limitless possibility had been implanted in each of their young and developing minds. I have also recently begun my second year in the school systems and have taken on several other classes as well. I am teaching an intermediate level course for adults and am also offering a free class with Colin Baker, once a week at the West End Community Center in Hartford . Currently I am teaching 7 classes a week, with other classes following soon at Central Connecticut State University and I have plans for others to come. This month is also the start of a new path within my healing practices; I will be studying at the Institute of Integrative Nutrition in New York City , for training as a holistic nutritionist and health counselor. I plan to incorporate my yoga teaching with my nutrition program and introduce the balance and symbiosis between these healing modalities into the school system in the near future. Look out for many more adventures to come!